The Holy Chalice depicted here by Juan Juanes (sixteenth century). According to Christian tradition and folklore, the Holy Chalice was the vessel used by Jesus at the Last Supper to serve the sacramental wine. It is often confused with the Holy Grail although the two relics are not necessarily synonymous. According to Catholic tradition, Saint Peter used the Holy Chalice during Mass, and took it with him to Rome. Following his death, the cup was passed on to successive popes until 258 C.E., when Emperor Valerian demanded that all Christian relics be turned over to the government during his persecution of Christianity. Pope Sixtus allegedly gave the cup to his deacon, Saint Lawrence, who passed it to a Spanish soldier, Proselius, with instructions to take it to safety to Spain. The subsequent association of the Holy Chalice with Spain continued by a series of Spanish monarchs, including King Alfonso, in 1200 C.E., who once borrowed from the Cathedral of Valencia, using the Chalice as collateral. When he defaulted on the loan, the relic became the property of the church. The Holy Chalice became the subject of much Christian folklore and legends. It remains an important relic for many Roman Catholics, especially those living in Spain. (In 1960, the Spanish archaeologist Antonio Beltrán studied the Chalice and concluded: "Archeology supports and definitively confirms the historical authenticity…" "Everyone in Spain believes it is the cup," Bennett said to a reporter from the Denver Catholic Register.) The celebration of the Eucharist emulates the Last Supper, using the bread and the chalice. 3 Relationship to the "Holy Grail"
Since the dawn of Christianity, relics have been an important part of Christian devotionalism. During the Middle Ages, the selling of relics became a lucrative business. The concept of physical proximity to the “holy” was considered extremely important. The pilgrims saw the possession and veneration of a relic as a means to become closer to God. The earliest record of a chalice from the Last Supper is the account of Arculf a seventh century Anglo-Saxon pilgrim who described it in De locis sanctis as being located in a reliquary in a chapel near Jerusalem, between the basilica of Golgotha and the Martyrium. He described it as a two-handled silver chalice with the measure of a Gaulish pint. Arculf kissed his hand and reached through an opening of the perforated lid of the reliquary to touch the chalice. He said that the people of the city flocked to it with great veneration. (Arculf also saw the Holy Lance in the porch of the basilica of Constantine.) This is the only mention of the Holy Chalice being situated in the Holy Land. During the Middle Ages, two additional candidates for the actual Holy Chalice stood out from the rest, one in Jerusalem, one in Genoa and the third in Valencia. 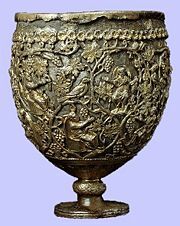 A fourth medieval cup was briefly touted as the Holy Chalice when it was discovered in the early twentieth century; it is known as the Antioch Chalice and is in the Metropolitan Museum, New York. Of two vessels that survive today, one is at Genoa, in the cathedral. The hexagonal vessel is known as the sacro catino, the holy basin. Traditionally said to be carved from emerald, it is in fact a green Egyptian glass dish, about eighteen inches (37 cm) across. It was sent to Paris after Napoleon’s conquest of Italy, and was returned broken, which identified the emerald as glass. Its origin is uncertain; according to William of Tyre, writing in about 1170 C.E., it was found in the mosque at Caesarea in 1101 C.E. : "A vase of brilliant green shaped like a bowl." The Genoese, believing that it was of emerald, accepted it in lieu of a large sum of money. An alternative story in a Spanish chronicle says that it was found when Alfonso VII of Castile captured Almería from the Moors, in 1147 C.E., with Genoese help, un vaso de piedra esmeralda que era tamanno como una escudiella, "a vase carved from emerald which was like a dish." The Genoese said that this was the only thing they wanted from the sack of Almería. The identification of the sacro catino with the Holy Chalice was not made until later, however, by Jacobus de Voragine in his chronicle of Genoa, written at the close of the thirteenth century. The other surviving Holy Chalice vessel is the santo cáliz, an agate cup in the Cathedral of Valencia. It is preserved in a chapel consecrated to it, where it still attracts the faithful on pilgrimage. The piece is a hemispherical cup made of dark red agate about 9 centimeters (3.5 inches) in diameter and about 17 centimeters (7 inches) high, including the base which has been made of an inverted cup of chalcedony. The upper agate portion, without the base, fits a description by Saint Jerome. The lower part contains Arabic inscriptions. After an inspection in 1960, the Spanish archaeologist Antonio Beltrán asserted that the cup was produced in a Palestinian or Egyptian workshop between the fourth century B.C.E. and the first century C.E. The surface has not been dated by microscopic scanning to assess recrystallization. The Chalice of Valencia comes complete with a certificate of authenticity, an inventory list on vellum, said to date from 262 C.E., that accompanied a lost letter of which details state-sponsored Roman persecution of Christians that forces the church to split up its treasury and hide it with members, specifically the deacon Saint Lawrence. The physical properties of the Holy Chalice are described and it is stated the vessel had been used to celebrate Mass by the early Popes succeeding Saint Peter. Reference to the chalice is again made in 1399 C.E., when it was given by the monastery of San Juan de la Peña to king Martin I of Aragon in exchange for a gold cup. The monastery's agate cup was acquired by King Martin I of Aragon, in 1399, who kept it at Zaragoza. After his death, King Alfonso V of Aragón brought it to Valencia, where it has remained. Pope John Paul II himself celebrated mass with the Holy Chalice in Valencia in November 1982, causing some uproar both in skeptic circles and in the circles that hoped he would say accipiens et hunc praeclarum Calicem ("this most famous chalice") in lieu of the ordinary words of the Mass taken from Matthew 26:27. For some people, the authenticity of the Chalice of Valencia failed to receive papal blessing. In July 2006, at the closing Mass of the 5th World Meeting of Families in Valencia, Pope Benedict XVI also celebrated with the Holy Chalice, on this occasion saying "this most famous chalice," words in the Roman Canon said to have been used for the first popes until 4th century in Rome, and supporting in this way the tradition of the Holy Chalice of Valencia. This artifact has seemingly never been accredited with any supernatural powers, which superstition apparently confines to other relics such as the Holy Grail, the Spear of Destiny, and the True Cross. Janice Bennett presents as historical evidence a sixth century manuscript Latin Vita written by Donato, an Augustinian monk who founded a monastery in the area of Valencia, which contains circumstantial details of the life of Saint Laurence and details surrounding the transfer of the Chalice to Spain. The original manuscript does not exist, but a seventeenth century Spanish translation entitled, Life and Martyrdom of the Glorious Spaniard St. Laurence is in a monastery in Valencia. The main source for the life of St. Laurence, the poem Peristephanon by the fifth century poet Prudentius, does not mention the Chalice that was later said to have passed through his hands. The Antioch Chalice, first half of sixth century, Metropolitan Museum of Art. The silver gilt object originally identified as an early Christian chalice is in the collection of the Metropolitan Museum of Art in New York City, It was apparently made at Antioch in the early sixth century and is of double-cup construction, with an outer shell of cast-metal open work enclosing a plain silver inner cup. When it was first recovered in Antioch just before World War I, it was touted as the Holy Chalice, an identification the Metropolitan Museum characterizes as "ambitious." It is no longer identified as a chalice, having been identified by experts at Walters Art Museum in Baltimore, Maryland, believed to be a hanging lamp, of a style of the sixth century. It appears that its support rings have been removed and the lamp reshaped with a base. Relationship to the "Holy Grail"
There is an entirely different and pervasive tradition concerning the cup of the Last Supper. In this better-known version, the vessel is known as Holy Grail. According to the Grail legend, the cup was used to collect and store the blood of Christ at the Crucifixion rather than being used during Mass. Yet, there is an underlying similarity between the Holy chalice and the Holy Grail: Both are used as repositories of Christ's blood. 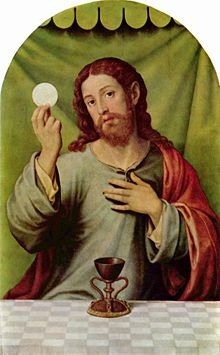 Since in Roman Catholic theology, the wine consecrated in the mass becomes the true blood of Christ, both of these seemingly conflicting traditions emphasize the vessel as a cup which holds the blood of Jesus Christ, either in sacramental or literal form. Oral tradition, poems and bardic tales combined the stories of the Holy Chalice and the Holy Grail. A mix of fact and fiction incorporated elements around Crusaders, knights, and King Arthur, as well as being blended with Celtic and German legends. In 1485 C.E., Sir Thomas Malory, combined many of the traditions in his King Arthur and the Knights (Le Morte d'Arthur), in which the fictional character of Sir Galahad goes on the quest for the Holy Grail. ↑ Janice Bennett, Saint Laurence and the Holy Grail: The Holy Chalice Of Valencia (Ignatius Press, 2004). Bennett, Janice. Saint Laurence and the Holy Grail: The Holy Chalice Of Valencia. Ignatius Press, 2004. ISBN 978-1586170752. Brown, Peter. Cult of the Saints: Its Rise and Function in Latin Christianity. Chicago: University of Chicago Press, 1982. ISBN 978-0226076225. Eisen, Gustavus A. The Great Chalice of Antioch. Kessinger Publishing, LLC, 2003. ISBN 978-0766142121. This page was last modified on 25 August 2008, at 20:13.